Two pieces of news here. The first is that a second article by John Stanton has just been published by Pravda titled, “US Army’s Human Terrain System: From Super Concept to Absolute Farce.” The second has to do with Montgomery McFate recently becoming a celebrity on city telephone poles. “Let’s just put the program on the ground and see if it works…” That statement from a high-level US Army official sums up the ongoing ad hoc, mercenary approach of the leaders of the US Army’s (TRADOC) Human Terrain System (HTS) program. As a result, multiple sources say that the HTS program is in the crash and burn phase. One source wondered, “Why did Intelligence, Civil Affairs, PSYOP and Special Forces allow their turf to be trampled on by TRADOC DCSINT? Why allow so much money to be wasted when those elements could have used it better?” HTS program management and other principals in the Pentagon/US Army became aware of many of the program’s shortcomings, including overlap with other operations, very early in 2007. According to sources, “The West Point Trinity,” along with Mr. Maxie McFarland (TRADOC, DCSINT), were primarily responsible for the ruinous turn of events in the HTS program. The West Point Trinity consisted of three USMA graduates: Ms. Karen Clark (an L3-MPRI contractor), Mr. Steve Fondacaro (Program Manager), and Mr. James Greer (Deputy Program Manager—now leaving the HTS program for the Department of Homeland Security). The West Point Trinity and McFarland have mismanaged, or more accurately not managed at all, a program that sought to bring in the best and brightest field-qualified ethnographers to enhance US military capabilities in Afghanistan and Iraq. Advising them along the way was Mrs./Dr. Montgomery McFate/Sapone (HTS Senior Social Scientist), one of the program’s creators and star marketer for the HTS program. Exceptionally qualified individuals were forced out of the HTS program for questioning management’s approach, ethics and decision making. Because of that, Fondacaro had them removed from the HTS program because they were “dinosaurs” and “too set in their ways.” Unable to find PhD or Masters Degree candidates with field-grade ethnographic qualifications, HTS program management now has BAE Systems seeking civilian lawyers and journalists to fill Human Terrain Team (HTT) vacancies to offset the shortage of qualified social scientists. HTT deployments to Afghanistan and Iraq are not taking place on schedule or on budget. Those that have been “trained,” including native-Arabic language specialists, await assignment while being paid full salary, daily per diem, and lodging expenses stateside. It is reported that some individuals refuse to deploy. Others are being sent throughout the USA and overseas to attend conferences. All sources reported that leadership, recruitment and training were critical to the HTS program’s success. Failure in any of these areas would lead to disaster. “As pointed out from the start, the weak points were and remain training and recruitment for anthropologists and military team members…There is a heavy price tag of $110,000 [and upwards of $200,000 for HTT leaders] per deployment but lots of academia’s best will not be swayed by dollars. Where are the assets for recruitment?” commented one source. Program oversight, discipline and accountability have been virtually non-existent from the beginning, according to multiple sources. One former participant in the HTS program believed that HTS management went way beyond acceptable legal and ethical boundaries. “I didn’t want to get Bubba for a cellmate,” said the source and so left the program. Another stated, “There is a complete lack of oversight and leadership. Leadership is the problem. Other sources said some HTS program personnel describe management as “war profiteers” who simply want to see the program continue no matter what the cost in lives or money. As of this writing, sources indicate that HTS program management has lobbied hard to gain a foothold in AFRICOM where poorly trained HTT’s would be deployed throughout the volatile Horn of Africa. Yet, according to the source, no hard requirements have been set for simple matters such as the amount of country visa’s needed for program participants. One source indicated that HTT’s “are studying politics (which has some cultural elements) but not culture in the restricted sense…Most of the [HTT] reports are boilerplate…Personnel (recruiting, vetting, etc. )…there are big problems there. Someone who really understands what HTT is all about needs to be interviewing potential recruits…BAE has got to go. I did not hear one positive comment about BAE during my entire time at Ft. Leavenworth or in the field…” Other sources have stated that the prime contractor BAE Systems is taking the brunt of the criticism for the program management’s failings. Further, anyone removed from the HTS program that dares to criticize it is pilloried vindictively. It is reported that the deaths of HTT members Nicole Suveges (Iraq) and Michael Bhatia (Afghanistan) were the result of command detonated mines/IED’s indicating that they were being tracked by adversaries. According to sources, both targets could have been better prepared had instructions and training proposed early in the life of the HTS program been adopted and executed. Forgotten is the fact that a US soldier on Suveges’ HTT was wounded in the same blast and had to be airlifted to Germany. John Stanton is a Virginia based writer specializing in national security and political matters. His most recent book is Talking Politics with God and the Devil in Washington, DC. Reach him at cioran123@yahoo.com. This is Part II on the HTS program. Part I was titled US Army Human Terrain System in Disarray. Questions/comments concerning this article were sent by email to the US Army (TRADOC) HTS Program Public Affairs Office. Through no fault of their own, they could not meet the author’s accelerated deadline. Amada Hess noted that she picked up the copy shown above at 18th St. & Columbia Rd. NW. Why am I suspicious? 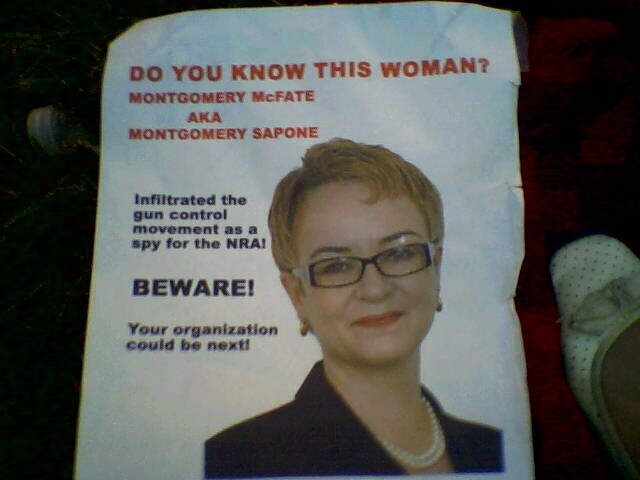 I find it difficult to picture a paper that hires journalists to burn expensive gasoline randomly driving around, and just by coincidence they spot this flier, that just by coincidence is in the neighbourhood where McFate resides. I sense a desperate attempt to prove McVictimization by McVillains. Or perhaps this is a joke, meant to bring neighbours’ gossip out into the open, so McFate can address it and dispel it. Anyway, it should make for a useful scene in any movie script that McFate may need to sell to make a living. I sense a sock puppet coming on.